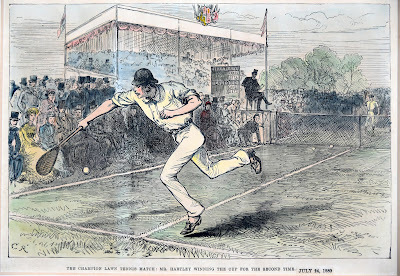 So it seemed with the development of Wimbledon’s All England Lawn Tennis Club from its beginnings in 1869 as a Croquet Club, at which “Gentlemen are requested not to play in their shirt sleeves when ladies are present.” However, with the addition of tennis courts to the grounds, the new game gained ascendency, and the first Wimbledon Tennis Championships took place in 1877. It was at the third tournament of 1879 that the Rev J.T. Hartley, vicar of Burneston in Yorkshire, won the All-Comers Gentlemen’s Singles out of an entry of 45 competitors at Wimbledon, and repeated the feat the following year. On the middle Sunday of the tournament, he was obliged to dash back to Yorkshire to deliver his church sermon before returning once again to complete his triumph. Never again was a clergyman to win Wimbledon (though in my own dreams I have appeared in the final a number of times). Many of the early players were highly idiosyncratic. In the 1921 quarter-finals Randolph Lycett was playing Zenzo Shimidzu on one of the hottest days in memory. During the third set, Lycett had to be revived with gin every time he changed ends. 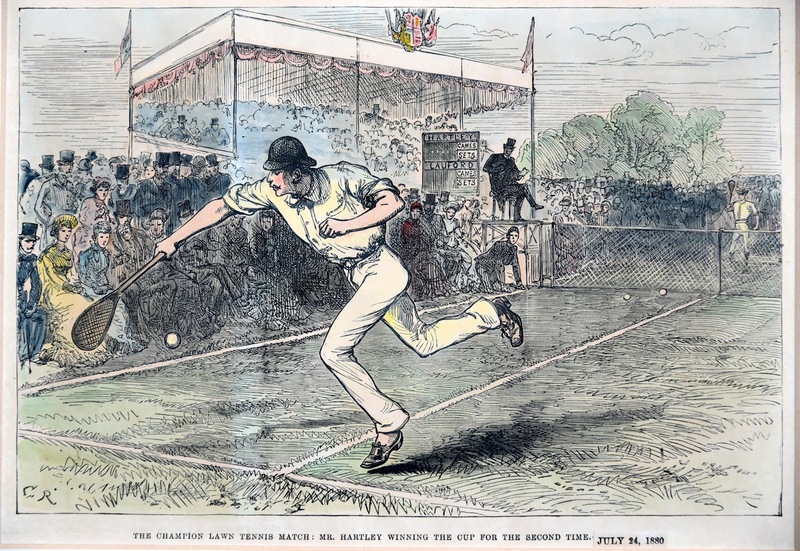 In the fifth set, muzzy and staggering, he ordered a bottle of Champagne to be brought out onto the Centre Court, and he consumed the last drop of it as the umpire called, “Shimidzu leads by nine games to eight in the final set.” The gallery hardly knew whether to object or sympathise when Lycett dropped his racket, and then on hands and knees crawled round in search of it. To most people’s relief Shimidzu won. Today a Bosnian, Novak Djokovic, as world’s Number One, leads a dazzling array of players who - almost universally - see Wimbledon as ‘the big W’ that can seemingly make a man or woman immortal. 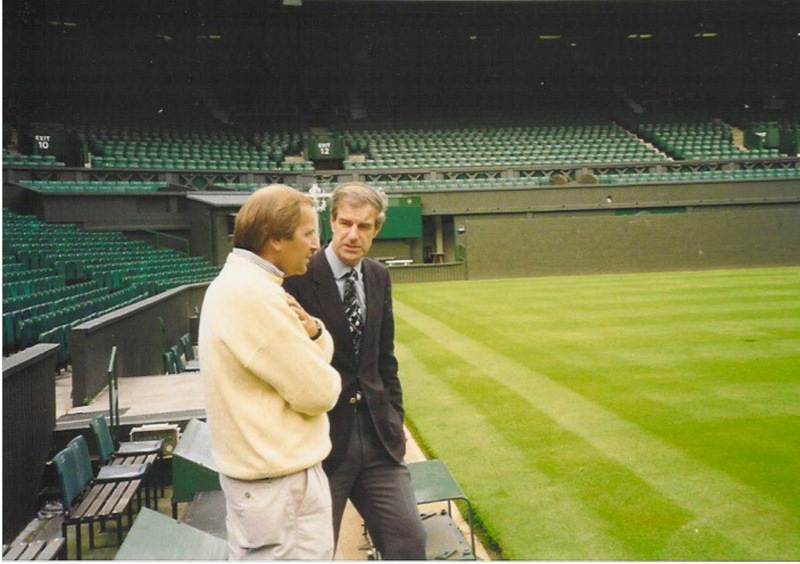 The man was Chris Gorringe, the CEO of the All England Club – the man we would see on TV, holding the winner’s trophy, before it was handed to the new Champion on Finals Day. Over the years I had come to know him. The mowers had been at work, and there were barrowfuls of grass ready to be disposed of. 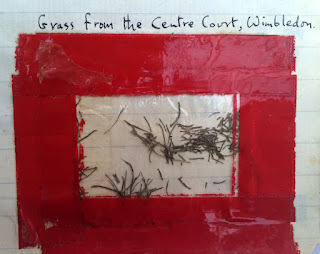 For the next few weeks I was giving little packets of the sacred grass to my friends. I KNOW A MAN. That was the secret. As a tennis clergyman myself I can’t resist wanting to do a Rev JT Hartley – perhaps only in reminding of what he stood for - that there is indeed a Man we can come to know; the CEO not simply of some tennis courts, but of the Central Court that governs the whole universe and puts meaning, divine friendship and eternal forgiveness into all of our existence. He is universal Champion of our salvation and His Name is Jesus Christ. Know Him – and your smallest prayer gets you to the Centre…. of everything. Hey, thank you JT !